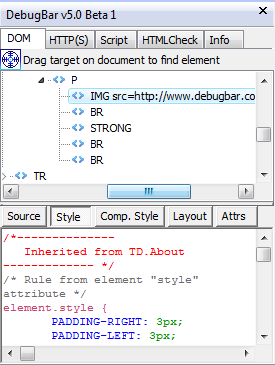 DOM Tab : View DOM Tree and modify tags attributes and css attributes on the fly to test your page. HTTP Tab : View HTTP/S request to check cookies, GET and POST parameters, view server info, and view AJAX requests with a custom icon. HTMLCheck Tab? : Validate HTML code to correct and optimize your code and html size of your page. Info Tab? : Misc. info on the currently loaded page.